Back in 2016, we were hyped for the Airlander 10, a 302-foot-long (the world’s longest) hybrid airship. But when it crashed on its second test flight, our enthusiasm was curbed. But a few days ago at the Farnborough Airshow, Hybrid Air Vehicles, an aerospace firm behind the craft, unveiled interiors of a tourist-focused Airlander, and now we’re hyped again. In collaboration with auto-aviation design consultancy Design Q, HAV designed interiors that live up to our expectations, but if you’re not a fan of heights, you may want to reconsider. 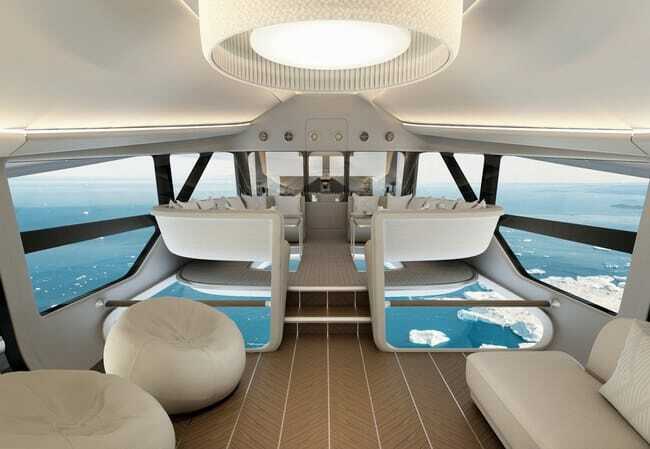 The entire cabin is covered in glass, including most of the floors, so you can take in all the views from 20,000 feet.